When you are short sighted your lenses are thickest at the edges – and a stronger lens means a thicker lens. The good news is that the edge thickness of your lenses can be significantly reduced if you have them made out of a higher refractive index material. A higher refractive index lens can focus everything more efficiently so that a thinner lens can do the same job as a thicker one of lower refractive index – like magic! And its lighter too! And if you want to reduce the edge thickness even further choose an aspheric lens. Here the edges of the lens are gradually flattened out to make them thinner – and lighter – with the added benefit of reducing the minification of your eyes viewed through the lens. Add an anti-reflection coating and you’ll never look back! This clever layer reduces all the light that reflects back from your lens improving your vision, reducing discomfort glare and making your glasses look much more attractive as people see your eyes through the lens and not the room reflected back at them. When you are long sighted your lenses are thickest in the middle and a stronger lens means a thicker lens that magnifies your eyes to a greater extent. Choosing your lens design carefully can make a big difference to the appearance of your glasses. A surfaced aspheric lens is computer designed to be as thin and light as possible in the particular frame that you have chosen and the way that particular frame actually sits on your face. Peripheral curves have been flattened to reduce both centre thickness and magnification caused by the lens power. If you want to reduce the thickness even further choose a higher refractive index material. 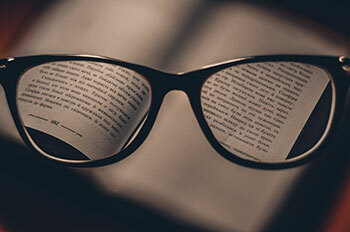 A higher refractive index lens can focus everything more efficiently so that an even thinner lens can do the same job as a thicker one of lower refractive index. And its lighter too! Transitions are an excellent react-to-the-light plastic sun lens ideally suited to everyone who wears their glasses all the time and would benefit from sun protection. A little more expensive but they serve a dual purpose as they respond quickly to lighting conditions resulting in efficient glare protection in full sun, but fading to a virtually clear lens indoors. Newer versions of react-to-the-light lenses are designed to cover an even greater range of conditions where glare can be uncomfortable or disabling. Transitions Xtractive react to visible light – rather than just ultra violet light – and this makes them more effective behind the car windscreen. Transitions Drivewear combine Polaroid technology with react-to-the-light technology to produce a really effective sunglass lens that cuts out reflected glare and visible light to doubly protect your eyes from discomfort and disability glare and harmful UV rays under all daytime lighting conditions. As well at reacting from behind the windscreen Transitions Xtractive (above) also go darker in hotter climates where the original transitions are less effective. Remember that eyewear itself is a potential hazard during sport and physical activity. Polycarbonate is a superior impact resistant material, ten times the impact resistance of standard plastic, essential for people who need their glasses for sport, or who are more at risk of injury. Polycarbonate comes with a protective hard coat as standard and has the added benefit of being lighter and thinner than standard plastic and fully absorbing ultra violet radiation. Ideally these should be fitted into a purpose designed sports frame so that any risk of eye injury posed by frame or lenses during impact is minimised.